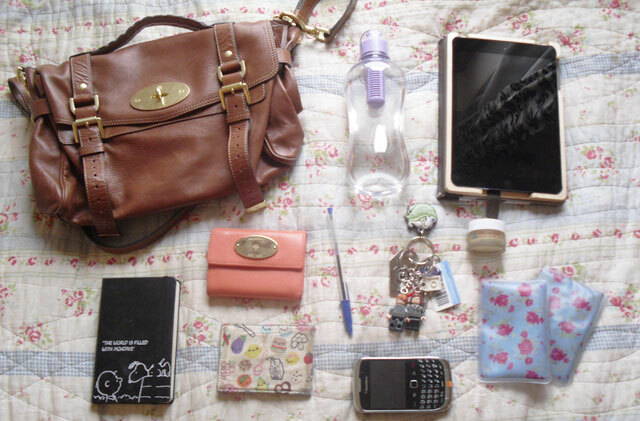 LUCY WOOD: What's In My Bag? I've been blogging on and off for three years now, and for some reason I've never done a What's In My Bag post, pretty much the stamp running through the stick of rock that is blogging. Who'da thunk it? So it's about time I did something about that. Unfortunately after I rummaged and displayed, the contents of my bag turned out to be not that interesting, but it's nice to be nosey anyway isn't it? First thing first is the bag itself, which is my little leathery child, the Mulberry Alexa, which was my big 21st birthday gift after clubbing the money together from pretty much every relative I hold dear. It's the regular version, so the perfect size for filling with all my essentials rather than stuffing it with unnecessary crap. I'd probably carry my cat around in anything bigger, so it's just as well. My purse is also a Mulberry number, and was a surprise 21st birthday gift from my boyfriends parents. I have no idea what make or colour it is, because it's from the outlet shop, but it shows how much I must have been going on about the bag for them to think of getting me this. I really love it, its a cute size and a nice vibrant colour. Ahhh my iPad mini. My Christmas present from Sean this year. I'm pretty much permanently attached to this thing, and can usually be found playing some kind of terrible game on it like Campus Life. No one else understands my need to complete the quests. AGH. My only beauty essential is a lip balm (BAD BLOGGER), and at the moment I'm favouring the Nuxe Reve de Miel stuff, but I usually have an eos egg shaped one hanging around in my bag too, but I have no idea where they are at the moment. Scatterbrain. The rest is all basically just nonsense that I for some reason consider important enough to have on me all the time. 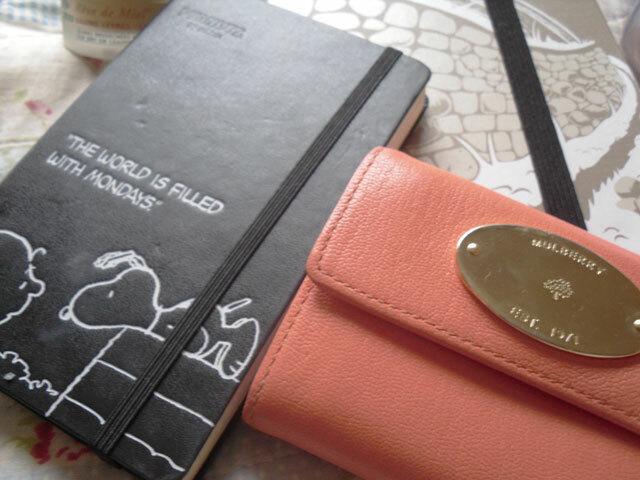 I couldn't live without my Moleskin Snoopy diary, if I didn't have it I would probably just stand on my doorstep and panic about where on earth I was supposed to be at all times. The Bobble bottle is a London living essential as it filters your water before you drink it, something I'm really funny about. The floral squares are handwarmers that have been such mini lifesavers whilst on my treks to uni in the snow. 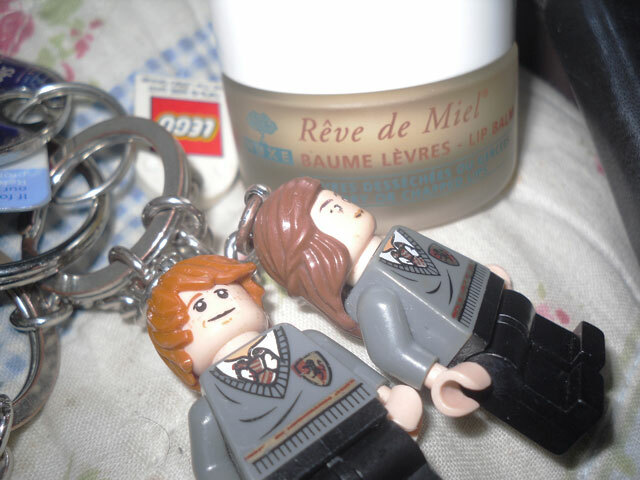 And finally, my keys which I just had to show off because I still can't get over how good my Lego Hermione and Ron are. Except Hermione's eyes are nearly scratched off so she won't be quite as cute for very long. Haha loved this! Your Mulberry fangirling is endearing! Such a beautiful brand. I'm like you, I either have one beauty product in my bag most of the time or I'll cart around half of my lipstick collection with me sometimes haha. Love the bag ! So jealous! That purse is gorgeous, very jealous of your Alexa. Love this, thanks for posting! I have a similar bag post, have a look if you like! I adore your bag! I wish I had a mulberry purse, lucky girl!